Meningococcemia is the presence of meningococcus in the bloodstream. Meningococcus, a bacteria formally called Neisseria meningitidis , can be one of the most dramatic and rapidly fatal of all infectious diseases. 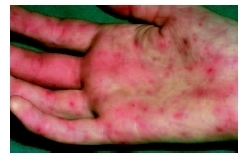 A close-up image of a person's hand with meningococcemia, caused by Neisseria meningitidis . The organism can cause multiple illnesses and can damage small blood vessels. illness that can produce death within hours. The bacteria, which can spread from person to person, usually first causes a colonization in the upper airway, but without symptoms. From there, it can penetrate into the bloodstream to the central nervous system and cause meningitis or develop into a full-blown bloodstream infection (meningococcemia). Fortunately in most colonized people, this does not happen, and the result of this colonization is long-lasting immunity against the particular strain. After colonization is established, symptoms can develop within one day to one to two weeks. After a short period of time (one hour up to one to two days) when the patient complains of fever and muscle aches, more severe symptoms can develop. Unfortunately during this early stage, a doctor cannot tell this illness from any other illness, such as a viral infection like influenza . Unless the case is occurring in a person known to have been exposed to or in the midst of an epidemic of meningococcal disease, there may be no specific symptoms or signs found that help the doctor diagnose the problem. Rarely, a low-grade bloodstream infection called chronic meningococcemia can occur. After this initial period, the patient will often complain of continued fever, shaking chills, overwhelming weakness, and even a feeling of impending doom. The organism is multiplying in the bloodstream, unchecked by the immune system. The severity of the illness and its dire complications are caused by the damage the organism does to the small blood vessel walls. This damage is called a vasculitis, an inflammation of a blood vessel. Damage to the small vessels causes them to become leaky. The first signs of the infection's severity are small bleeding spots seen on the skin (petechiae). A doctor should always suspect meningococcemia when he or she finds an acutely ill patient with fever, chills, and petechiae. Quickly (within hours), the blood vessel damage increases, and large bleeding areas on the skin (purpura) are seen. The same changes are taking place in the affected person's internal organs. The blood pressure is often low, and there may be signs of bleeding from other organs (like coughing up blood, nose bleeds, blood in the urine). The organism not only damages the blood vessels by causing them to leak, but also causes clotting inside the vessels. If this clotting occurs in the larger arteries, it results in major tissue damage. Essentially, large areas of skin, muscle, and internal organs die from lack of blood and oxygen. Even if the disease is quickly diagnosed and treated, the patient has a high risk of dying. The diagnosis of meningococcemia can be made by the growth of the organism from blood cultures. Treatment should begin when the diagnosis is suspected and should not be delayed by the doctor's waiting for positive cultures. Obtaining fluid from a petechial spot and staining it in the laboratory can assist in quickly seeing the organism. Immediate treatment of a suspected case of meningococcemia begins with antibiotics that work against the organism. Possible choices include penicillin G, ceftriaxone (Rocephin), cefotaxime (Claforan), or trimethoprim/sulfamethoxazole (Bactrim, Septra). If the patient is diagnosed in a doctor's office, antibiotics should be given immediately if possible, even before transfer to the hospital and even if cultures cannot be obtained before treatment. It is most likely that the speed of initial treatment will affect the ultimate outcome. As many as 15 to 20 percent of patients with meningococcemia will die as a result of the acute infection. A significant percentage of the survivors have tissue damage that requires surgical treatment. This treatment may consist of skin grafts, or even partial or full amputations of an arm or leg. Certain people with immune system defects (particularly those with defects in the complement system) may have recurrent episodes of meningococcemia. These patients, however, seem to have a less serious outcome. Although a vaccine is available for meningococcus, it is still difficult as of 2004 to produce a vaccine for the type B organism, the most common one in the United States. Because of this and the short time that the vaccine seems to offer protection, the product has not been routinely used in the United States. It can be used for travelers going to areas where meningococcal disease is more common or is epidemic. In the early 2000s, the vaccine has been suggested for use in incoming college freshmen, particularly those living in dormitories. These students appear to have a somewhat higher risk of meningococcal infections. It is, however, recommended that all people take certain antibiotics if they have had contact (like at home or in a daycare) with a person who has meningococcal infection. The most common antibiotics given are rifampin (Rifadin) or ciprofloxacin (Cipro). These medicines are usually taken by mouth twice a day for two days. This treatment will decrease the risk of infection in these people who have been exposed. However, the overall risk to people who have been exposed, even without antibiotic use, is probably no more than 1 to 2 percent. Blood culture —A procedure where blood is collected from a vein and is placed in a small bottle that contains a special liquid; the liquid will make any organisms that are present in the blood sample grow. These organisms can then be grown and identified in the laboratory so that the proper antibiotic can be given to the patient. Colonization —The presence of bacteria on a body surface (like on the skin, mouth, intestines or airway) without causing disease in the person. Complement —One of several proteins in the blood that acts with other proteins to assist in killing bacteria. Swanberg, Margaret M., et al "Speech and Language." In Textbook of Clinical Neurology. Edited by Christopher G. Goetz. Philadelphia: Saunders, 2003. Woods, Charles R. "Neisseria meningitidis (Meningococcus)." In Nelson Textbook of Pediatrics. Edited by Richard E. Behrman et al. Philadelphia: Saunders, 2004. Lepow, M. L. "Meningococcal immunology." Immunology and Allergy Clinics of North America 23 (November 2003): 768–86. Weir E. "Meningococcal disease." Canadian Medical Association Journal 166 (April 2002): 1064–6. what are the doctor's recommendation or advise of meningococcemia?